How to make a proper glass of sweet tea. Bring 250ml of water to a vigorous boil. Steep two Lipton tea bags in the water for four minutes. Remove the tea bags from the water. Stir in four heaping teaspoons of sugar. Pour into a large mug full of ice. All steps must be done quickly; the tea bags must be in the water seconds after you remove it from the stove or microwave, don't go toddling off the bathroom and letting the water cool even a degree; the tea bags must be removed at four minutes sharp, etc. You get the idea. Yes, Lipton. None of those new fangled, green, chai, floral, or &diety;-forbid decaffeinated teas. In a pinch, caught unawares in a place that wouldn't be so pedestrian as to carry Lipton, you may opt for an English Breakfast Tea, but don't let it become a habit. Hanging out in places that don't have Lipton, that is. 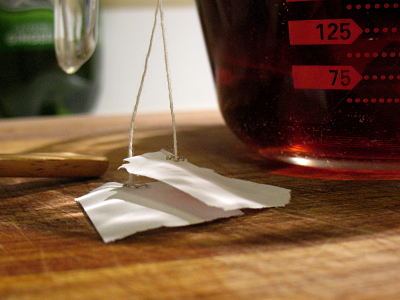 When removing the tea bags from the water be sure to squeeze most of the water out of them, that's what the paper label is for, to squeeze the tea bags against the spoon. When I say heaping teaspoons of sugar, I mean really heaping. If the viscosity of the tea doesn't change after adding the sugar then you aren't doing it right. The mug you pour the tea into must be large, 500ml, and must be filled to the brim with ice. If you do it right about half the ice will melt when you pour the tea over the ice. Failure to follow these directions precisely - if the water isn't warm enough, if the tea bags steep for too long - and you will end up with a nothing more than a sugar sodden stew of bitter tannin. On ice. Nobody wants that. Ah, I haven't had a good sweet tea since I moved out of Texas. I'll have to give this a try. I wonder if Bush's Chicken will ever make it out to the west coast. You can't make a _proper_ cup of sweet tea using metric. Sweet tea's a 'merican bevrage, son.